Let’s be frank: Friends shouldn't let friends eat bad meat. It's time to stage a "Wienervention" and Applegate is here to help. A new survey finds that while 92% of Americans bought hot dogs in the last year, 80% agreed that most hot dogs are low quality and unhealthy. So when it comes to hot dogs, Applegate think it's time for a "cleaner wiener." More than 90% of people who consume hot dogs would rather purchase franks with a short ingredient statement, and that's where Applegate steps in. Their ingredient list is simple: beef (that has never been administered antibiotics or hormones), water, salt and spices. It's time to say goodbye to those dirty dogs filled with sodium phosphate, sodium nitrate, and who knows what else! Applegate happily acted as a "Meatiator" and provide me with a "Wienervention" kit to ensure me, my friends, and readers of my blog to enjoy cleaner wieners and never look back. The kits have the makings of a full-force backyard barbeque - without the junk! 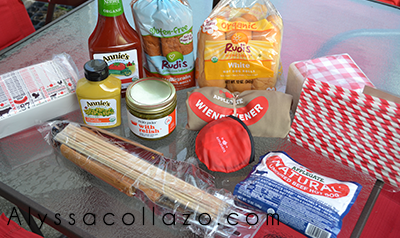 They include: Applegate Naturals Beef Hot Dogs - Rudi’s Hot Dog Buns (White and Gluten-Free) - Annie’s Organic Ketchup and Mustard - Rick’s Pick’s Relish - Applegate Apron - Grilling tool set - Frisbee - Mini Applegate Cooler - Susty paper straws and napkins. I'm a huge fan of Applegate and my family loves their amazing Natural Beef Hot Dogs. They are a MUST for summer barbeques! 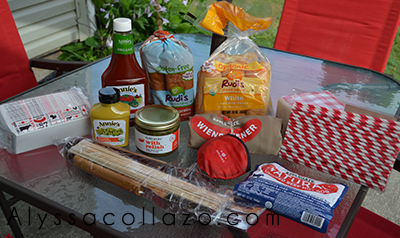 I couldn't wait to host a "Wienervention" barbeque and explain all the benefits of Applegate! Now it's YOUR turn to host a "Wienervention"..
Applegate is giving ONE of my lucky followers the chance to win a "Wienervention" kit! Applegate "Wienervention" Giveaway: One (1) winner will receive: a "Wienervention" kit. Ends 7.31.14. Enter to win a YEAR'S supply of Cleaner Wieners! Tweet or post photo's with hashtag #wienervention and be entered to win a year's supply! I love putting banana peppers on my hot dogs! I haven't had a good hot dog in forever .. I would love to try this right before summer ends! I like mustard and relish on my hot dog. These hot dogs are delicious! I also love their turkey apple sausages! My favorite hot dog topping is mustard...that is a must. I have tried Applegate products before, but not their hog dogs yet. My favorite topping is ketchup. I didn't realize that Applegate carried hotdogs. Sounds like a better alternative then what we get. Applegate has some awesome products. I love their cold cuts. The answer to my prayers has finally come! Hot dogs that won't kill me! I love hot dogs, but I never eat them because they have so many terrible ingredients in them. I've got to get some of these! I think, do not quote me, but we have bought these and my kids absolutely love them.. We only eat dogs on the bbq, so when we bbq they are always on ready to be eaten! Oh this is making me hungry. yum. I'd love to try these hot dogs! I love Omaha Steaks hot dogs but don't get to eat them often. I bet these ones might even be less expensive. I'm so boring. Ketchup and mustard please! I rarely have it in stock at home, but when I'm at a restaurant I love to pile on the relish! What an awesome kti! For us, these ingredients are summer staples. My kids like Rudi's bread and we have some of applegate's sausages. Looks like a great kit! I haven't tried Applegate, but love when products have a short ingredient list without tons of junk added to it. My hot dog loving boys would adore this kit. I prefer more natural ingredients in my hot dogs as well. great giveaway! I love banana peppers on my hot dogs! Yum! I like to chop up bread and butter pickles to use as relish. My favorite hot dog topping is putting baked beans on them! YUMMY! My favorite hot dog topping is anything that they put on Chicago style dogs. I thought it would be gross to try when I visited, but I loved it! I think it is a pickle, a pepper, and some other hot things, but I'm not sure. My favorite hot dog topping is relish! Yum yum! We have a hot dog dinner at least once a week, been eating turkey hot dogs, but also love a good beef dog. We love all the toppings added too. Not sure these are in my area. surprisingly, I haven't had a hot dog yet this summer! It's going by way too fast! My brother would love this. He's a hot dog person. He could have it everyday and never grow tired of it. Goodluck to all participants. They're all in for a good treat. My favorites are mustard, relish and tomatoes. If we eat "hot dogs" they are the all beef version. We don't do the regular ones. Only kosher dogs for us. I would probably try these with my kids. I love hotdogs the first 2 trimester of my pregnancy is all I wanted to eat with pickles a mix of mayo and ketchup and sauerkraut yummy!!! I dont usually eat hot dogs for this very reason. I will have to look for these in our grocery store, they are a super easy meal. Sounds like great German items! I would so try these, love hot dogs~! My kids love Hotdogs!! I would this contest if I could. I like my hot dogs fully dressed...ketchup, mustard, onions, relish..all of it!! I love hot dogs and love hot dogs with chili, cheese, onions and many other ways. I never heard of this brand though. This is awesome giveaway, I will join. Wiener is our favorite hotdog brand, my kids love it. By the way my favorite hotdog topping is mustard. I love hotdog sandwich with mustard and mayonnaise. This is an awesome giveaway and if I'm from the US I'll surely join the contest. Good luck to all joining. I guess I boring, just ketchup for me. I like saurekraut on mine! I am an everything girl. The more toppings the better. But my must haves are spicy mustard and relish. This all looks tasty, but I like to stick with my ballparks, there's nothing better than those, loaded with everything on it. I like ketchup only on my hot dog! I do not like toppings on my hot dog. I'd rather eat them as is. Very cool review and I love your pictures from the display! MMM I love hotdogs. I love mine with mustard, ketchup, and sauerkraut! Yummy! I like your puns! Unfortunately I'm not a punny as you so I'll leave the humor to you! Chopped tomatoes and avocados are hot dog topping perfections! My favorite hot dog topping is mayo, which most people find to be very weird. I've even had restaurants refuse to put mayo on my hot dogs. Your pictures are so inviting! Super ultra yums! Looking forward to our summer for bbqs. I love sweet relish and ketchup on my hot dog! My favorite is onions!I don't think a hot dog tastes good unless it has chopped onions on top. My favorite hot dog topping is honey mustard or regular mustard! So delicious. Thanks for the opportunity for a fun date night at home! Tomatoes and ketchup on top of mine is great! I love spicy mustard with sauerkraut yummy!!! This would be great for my sons party coming up! My favorite topping is Spicy Brown Mustard! I love grilled onions and spicy mustard on my hotdogs! Onions, Mayo, Chili, and Cheese.